All right you lot; from all corners of the material world of Terra you’ve made your way here to be inducted into the Seelie Court. The good news is that by even finding this place you’ve proven yourself worthy of induction. The bad news is the real work starts now. My name is Mangus and I’ll be in charge of your orientation to the Seelie Court, so pay attention. As I’m sure you’re aware, our world is balanced and maintained by the interplay of Seelie and Unseelie energy. Positive and Negative, Light and Dark, Yang and Yin. However far apart we have grown from our brothers and sisters in the Unseelie Court, they remain just as essential to the future of Terra as we are—and there would be no shame in serving with them in the name of balance; though you would be at the wrong orientation. Undoubtedly you have noticed the turmoil in the world as of late. The truth is, as critical as balance is for the stability of the world, it doesn’t always come easily. Constant change is the nature of life; all is ephemeral and evolving even when the change isn’t outwardly evident. Sometimes when things drift too far from center, the rebalancing can become volatile and damaging. While in the grand scheme of things this still carries the world forward, it can be unpleasant for those damaged by it. What you may not be aware of is that one thousand years ago The Primal Council decided to spare the world at large the pain of rebalancing by embodying the Seelie and Unseelie principals in chosen champions at times of severe imbalance. The battle between the two champions thus takes the place of world-wide war, and the result is carried forward to the rest of the world by fey power. We are now nearing a confrontation of champions, so I want you all to pay attention because three of you will be chosen to be present as witnesses to the battle—a great honor for new inductees such as yourselves. First it is worth clarifying the nature of fey power, that which sets apart and makes us suited to be care-takers of the world. While mortals can wield Seelie or Unseelie energy if we give it to them, we fey are essentially physical manifestations of that energy. Only fey are inducted into either the Seelie or Unseelie courts, though here we do have an order of mortal Dapper Knights who we grant special privileges in assisting us. However even the Dapper Knights are not allowed into this sacred hall except in truly exceptional circumstances. I realize that some among you may not be full fey, but there is no doubt based on the fact you were able to enter this place of your own power that you do have fey blood. Historically fey have arisen from the fey energy of the world spontaneously—myself and many of my fellow Primal Council Members arose this way. However as mortal races have flourished we fey have also adopted their method of partnered reproduction, in which case children are likely to be born with traits inherited from their parents. Some of you may even have mortal parents, but remember that membership in the Seelie Court represents a commitment to your fey half. Though we each have natural forms and talents which come to us easily, as we master the fey energy from which we arise we are able to manipulate our forms. More powerful fey are able to alter their physical size with ease, and some can even freely alter their appearance. Also, just because we align ourselves with the Seelie energy in the world don’t think we don’t have Unseelie aspects to ourselves. Seelie and Unseelie are two sides of the same coin, and as creatures of Terra we all have both within us. We choose to align ourselves with one power over the other because maintaining personal balance is much more difficult than having the external balance of the opposing Courts. Though there are some, like Lunaria—our current Head of the Primal Council—who do choose to maintain personal balance between Seelie and Unseelie. I don’t recommend it for you inexperienced or passionate individuals, but those with calm centers and an intuitive grasp of balance may find it appealing. There are creatures of pure Seelie and pure Unseelie energy that exist beyond our realm—celestials and fiends respectively. Though fey such as us can resemble the angels and demons who purely embody one side of the energy or another, we are fundamentally different because we do contain both—and our personal balance can even shift as Terra’s balance does. Those outsiders are concerned with cosmic balance, which is beyond the scope of the Seelie or Unseelie Courts’ aims. Looking around you can see there are many types of us fey; fairies, pixies, leprechauns, and nearly every stripe of creature from mortal legend. Now, you do not see any elves here. This is because elves are in fact the first race of mortals; they are extremely long lived and very closely connected to fey energy, but never arise spontaneously from the fey-energy of the world. They can be shaped by Seelie or Unseelie forces to a much greater degree than other mortals, but in the end fall just short of our level of influence. You see, one of our critical distinguishing features is the ability to generate Seelie and Unseelie energy from within ourselves instead of having to call it out of the environment in the way mortals do. You may have already discovered your own ability to generate Seelie and Unseelie power in order to achieve magical effects. But here’s a secret that you may not have been aware of; each fey has a personal Pleasure and personal Vice that respectively generate their maximum amount of Seelie and Unseelie energy. The most powerful of us, including myself, Lunaria and other Primal Council Members, will generate more Seelie energy by doing good than some fey can achieve even with the most exquisite form of their Pleasure—but it is worth knowing your Pleasure so you can draw on your full potential if you have to. I also recommend figuring out your Vice, if for no other reason than to make sure you do not accidentally indulge in it. They aren’t always what you’d expect, but somewhere in your heart you will already have a secret knowledge of what your Pleasure and Vice are. Do not share your Vice with anyone. Unseelie infiltrators would love to corrupt you and turn you to their side using Unseelie energy, and your Vice is your weakest point as far as that is concerned. Balance is important, but as I’ve said, the act of balancing is at times rough. In coming here you have expressed an interest in upholding the Seelie side of the scale. Once inducted into the Seelie Court you will be assigned rank and duties according to you aptitudes—the greatest among you may be barons, knights or other distinguished positions right from induction. Others will work their way up through the ranks as your experience grows, and many will be inducted as simple courtiers and find the position to your liking and never seek advancement. Some of you may choose to become involved in our Fey Ally system and partner with mortal Dapper Knights for fieldwork and missions among the mortal races. Others may accept duties that keep you for practical purposes constantly stationed here at the Court. The only position you cannot have upon initial induction is seat on The Primal Council, that comes only with experience within the Court itself. Now that you’ve got a bit of an understanding of how things work it’s time for introductions. As I said before, my name is Mangus. I am a leprechaun; I fought in the original balance wars before the implementation of the champion system. It was during those wars I lost my left eye to a harpy. My Pleasure is singing, don’t snicker, I’m actually quite good. I’ve been on the Primal Council for the last five hundred years, and my element is Earth. Ah, yes, elements. That’s something else I forgot to mention. You may or not be aware of your ‘element’ at this time. It’s some very basic thing for which you have a natural affinity. In my case my element is earth; I draw strength from the ground and am able to easily impose my will on it with highly efficient expenditures of Seelie or Unseelie energy. Your elements may not be so classical—for example Lunaria’s element is Death, and our Speaker Althea’s element is Life. So now, introduce yourselves with name, species, and Pleasure and Element if you know them. You then have 250 words to tell a story about yourself that shows your character and why you should be one of the three present at the battle of the Champions. Submissions after December 5th will not be considered in the running for attendance at the battle. First place will have speaking lines in Lost Girls’ Society, Second place will be mentioned by name, and Third place will be present but not speak or be identified by name. Any questions can also be resolved as comments. Almost due north of The Silver Temple is the village of Holt in Kakarus. Holt has never been a large village, though it rose around a trading port. At the height of the Kingdom Holt served as a sort of back way into Kakarus used mostly by fugitives, smugglers and those seeking to avoid too much attention. Near to the elven forests, Holt was also a popular way-point for elves who had business with the humans. Otherwise it was mostly populated with local fishers and tradespeople who supported the capital. The main sea route into Kakarus was through the much larger port town of Drakecrest to the west, which was considered the first stop on the pilgrimage to the Silver Temple. Due to the religious nature of Kakarus the vast majority of travelers and in turn merchants chose to follow the long road from Drakecrest rather than take the more direct but less prestigious road from Holt. With the fall of Kakarus however Drakecrest came under seige and was the last major stronghold of Kakarians during the dark rule of Letemra the Death Gate. Due to its unobtrusive nature however Holt was largely ignored by the invading demon hordes and for many years served as a place for refugees to gather and even escape to Yore, with support of the elven people in fending off the few demon attacks that did come their way. One year before Holt was finally overrun by Death Cultists the elves stopped coming however, and rumors surfaced that Letemra may be taking advantage of the town’s out-of-the-way nature for his own dire purpose. The Eternity Grove is the font of life and central nexus for the world of Eterny. Eterny is a far distant world from Niar, in fact not even existing in the same solar system, and is much smaller requiring a mere two days of foot travel to make a complete circuit in any direction. The Eternity Grove exists at the center and is the source of magic for the elves of Eterny and their fey allies, as well as the world’s primary source of light. Day and night do not occur in cycles but rather are extremely localized manifestations of individual will. Eterny is essentially a single large amalgamation of plant life, held together by the mystic force of the Eternity Grove. The Eternity Grove is The Sacred Site in Eterny, and governed by an Eternal Speaker who represents the wisest and eldest of the elves. Due to the unique nature of Eterny the Star Elves who live there are more aware of other worlds and able to travel between them using their advanced magic. Though there is no record of Eternal Elves ever traveling as far as Niar, Kara Mooncall of Eterny is the mother of Naomi, who did come to Niar not long after her father Letemra the Deathgate. The dukedom on the Eastern side of the Viura Mountains; Heathhill has long been a productive subordinate domain to the Holy Kingdom of Landis. Geographic isolation allows Heathhill to remain relatively independent however, and there is a strong spirit of adventure and entrepreneurship, with merchants being among the most powerful in the dukedom—though Heathhill is self-sufficient in terms of agriculture and fishing in spite of less than ideal rainfall for growing. Oranis is the capitol of the entrepreneurial Dukedom of Heathhill. It began as a trading town on the wild side of Lost Dragons’ Pass, but trappers and adventurers and eventually the merchants who supported them made Oranis explode in population and size almost overnight. Oranis is a city of wealth and innovation, though not immune to the troubles frequently resolved by the Church back in Landis proper. 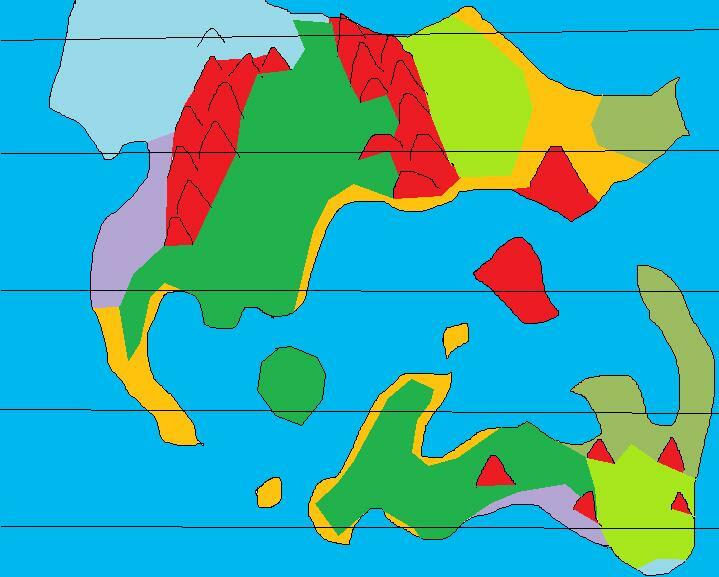 Compared to the mountainous continent of Yore and rocky dividing islands, the continent of Asla is quite level. The four significant mountains on Asla are known as the Four Talon Mountains, and are located equidistant from the Silver Temple at perfectly ordinal points. From a distance each mountain’s peak appears to curve inward toward the Silver Temple, like the talons of some truly massive dragon. Folk-lore even postulates that the mountains may in fact be the talons of the original dragon, which in turn some claim would have to be the lone god Solitude. Scholars and priests however believe that the mountains instead of being the talons of some colossal entity, are instead the remains of a more ancient temple attuned to the same ley-energy that the Silver Temple’s Life-Sanctum is situated directly above. Many believe that somewhere in the oral history or racial memory of the elves of Asla is the truth about the Four Talon Mountains, but if the elves do know anything they aren’t sharing that information with outsiders and seem content to leave the mountains and inland alone–though when passing near any of the mountains all of the more tribal elves do seem to pause to pray to the mountains. The safest passage through the otherwise monster dense Viura Mountain Range. It is said that in ancient times a great hero–in some accounts the draconic deity, Solitude–fought and defeated 100 evil dragons in the pass, carving away the mountains that had been there. For whatever reason monsters rarely appear within or around the pass. The Viura Mountains are a chain of dormant volcanoes. The pass is popular among lowlanders from both sides of the mountain range because of its comparatively gentle slopes, lower elevation and sparse monster population. The more hardy and less classically civilized mountain folk of the Viura Mountains in turn often avoid the Lost Dragon’s Pass and unnecessary interactions with from their perspective pretentious lowlanders. Scholars and locals have long disagreed as to whether the proper name for the pass refers to a single lost dragon or multiple lost dragons. Generally opinion breaks along the lines of those who believe Lost Dragon refers to the enigmatic deity Solitude who may have been the one to carve the pass with his legendary battle, versus those who believe that whether or not Solitude was the one to clear the pass the name is derived from the one-hundred evil dragons who were lost in the battle. The largest Northlander city, Tionburg is the fortified capital of the north. A city of ice and snow through all but the green summer months, its people are hearty warriors and foremost among the famous northern mercenaries. This is Sheya’s hometown, and is ruled by a council of elders on which her father sits as representative of the mercenaries’ interests. Tionburg was in fact the first city in the north, established more as a defensible structure than a residence since at the time the Northlanders were an almost exclusively nomadic people who lived from the land and raiding more civilized areas. Over years as they developed their reputation as mercenaries they abandoned raiding, took up farming and began living in cities so as not to alienate any potential clients–and to avoid being hired to take care of their own raiding parties. The Tower at the heart of Tionburg is the ultimate defensive structure in the north and most clear reminder of the city’s origins, and as such is the seat of government and also the most secure location in the North if not all of Yore. The old capitol of Kakarus, located at the center of the Four Talon Mountains, and built by the ancient elves to harness the Ley energy in the location generations before humans came and built the Knights of the Aegis, the original and most prestigious order of Demon Hunters—named for the legendary shield housed in the Temple. The capitol city grew around the temple, but the devoutness of those who lived there led them to consider their homes and businesses but extensions of the Silver Temple itself—and the architecture was designed to match with the city paying when the individual couldn’t afford the silver inlay. 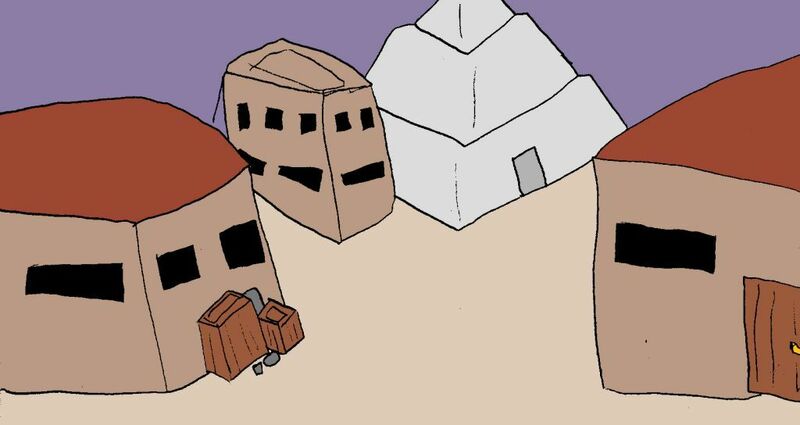 This was Andrew Banisher’s hometown, and his sword (Banisher) and symbol (Oracle) are the only surviving relics of the Silver Temple (even the Aegis itself was destroyed with Letemra’s coming). Silver Temple has since become the base of operations for the Fallen God, Letemra, in his quest to rebuild his power and destroy all of Niar on his way to doing the same to Heaven. The Stellan Temple is the heart of religion and faith in the Holy Kingdom—and the site of countless pilgrimages from across the world. It houses 7 Orders of clerics, monks, nuns and priests, each dedicated to and named for a different level of Heaven, and most importantly houses the most sacred relic on the continent of Yore–Heaven’s Staff. In a high valley between the World Forge and Viura Mountains the Stellan Temple is in a highly defensible position, also protected from all but the occasional northern storm. The Mercurian and Venyan Order buildings provide isolated communities for their ascetic members, while at the same time guarding the two best routes up to the temple from Landis, and in position to intervene in the unlikely event of enemies appearing from the inhospitable northern reaches of either neighboring mountain chain. The Mertion Cathedral is positioned north of the main Temple to provide isolation for its members as well as defend the main north route to and from the Stellan Temple, which while the least likely to be disturbed is also the most likely to be serious if it is due to the harsh strength of the northern mercenary peoples. The Lunian Tier is the sprawling ground level with an elaborate courtyard connecting various residences, shops and other conveniences designed to not only accommodate aspirants of the Order but also pilgrims and other guests from across Niar. The Solanian Tier can be reached from ramps or stairs leading up from the Lunian Tier in many places, and is a place of instruction and libraries reserved for the faithful, as well as training areas for miracle working. Considerably smaller and only reached by guarded points is the Jovarian Tier where powerful miracles, magic and secrets of the Temple are guarded by respected authorities of the Temple. Crowning the temple is the Chroniasan Tier, looming over the rest of the temple with heavenly majesty but rarely seen or visited by any but the vaunted Illuminated Order and personal guests of the Grand High Priest himself, and even they only get to see his office or in rare instances library. Access to the Courtyard of the Illuminated where the Heaven’s Staff is kept is restricted to the 7 Illuminated.